Entrepreneurs are risk takers who willingly invest in a business with the sole aim of making profit. No one is born an entrepreneur, rather entrepreneurs are made, built, guided and nurtured. The sustainability of any enterprise largely depends on lots of factors, of which monitoring and mentoring is one. However, to strengthen the monitoring and mentoring apparatus of the job creation programme, Governor Okowa established the Directorate of Youth Monitoring and Mentoring (DYMM), to track the performance of STEPreneurs and YAGEPreneurs. In line with the mandate, the agency is charged with the responsibility to monitor youths while on training; mentor and monitor established youths until they are able to stand on their own and to liaise with various MDAs with responsibility for youth job and wealth creation. 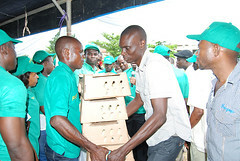 As part of their activities, a one day Interactive Meeting with the 2015 Cycle beneficiaries of STEP/YAGEP were recently organised by DYMM in seven locations across the state, namely Ughelli, Warri, Ozoro, Kwale, Sapele, Agbor and Asaba to feel the pulse of these young entrepreneurs who have been running their enterprises in the past one year and half. The attendance was quite impressive and testimonies from the beneficiaries were clear indications that the State Government has done well in creating entrepreneurs out of jobless youths. While some sang the praises of the initiator who through the job creation programmes has taken them off the streets to become chief executive officers, entrepreneurs or directors of their business outfits, some pointed out their challenges, calling on the State Government for interventions. In all, Governor Ifeanyi Okowa as the chief mentor of the job creation programmes was at the grand finale held in Asaba to assure them of the State Government’s commitment to their success. He tasked them to be persistent and resolute in the faces of challenges in order to succeed. 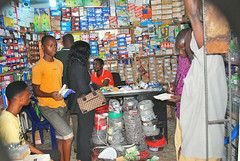 He remarked that passion and determination are the tonic they need to succeed. He said the interactive meeting was necessary to strengthen existing enterprises through the offer of business clinics, micro credit and agricultural extension services, especially for YAGEPpreneurs in livestock production spread across YAGEP cluster farms in the state. He lauded the innovation, diversification and successes recorded by most of them, urging them to explore the option of partnership as well as attracting more customers through the social media as some of them were already doing. Most importantly was the issue of patronage of their services by Government. To this end, the Governor mandated the Office of the Chief job Creation Officer to collaborate with the DYMM to link them to State Government contractors who would require their services. It is worthy to note that only a visionary leader who genuinely seeks the wellbeing of his youths would do all these. Governor Okowa deserves commendation. Governments at different levels have had empowerment programmes in the past, but the bane of such programmes had been lack of follow-up to mentor and track the performances of the beneficiaries in order to forestall business failure. 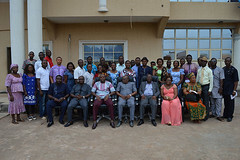 On his part, the Chief Job Creation Officer, Prof Eric Eboh, said the establishment of the DYMM was apt and timely with the hope that it would enhance mentoring of beneficiaries after establishment of enterprises and, therefore, improve the implementation of job creation programmes. While assuring them of government’s support at all times, he charged them to take full responsibilities of their actions and inactions. He urged them to strive for success at all times so as to actualize the vision of the Governor of nurturing them into great entrepreneurs who would drive the economy of the state. 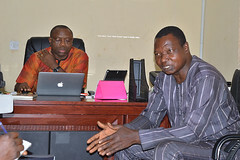 Earlier, the Special Adviser to the Governor on Monitoring and Mentoring, Mr Edward Mekwunye, harped on the essence of the interactive meeting with them which he said was to ensure that their success is sustained. He assured them that all challenges and all inhibitions to their growth will be addressed. He pointed out that the meeting was to kick-start the mentoring programme with established STEPreneurs and YAGEPreneurs in the state. 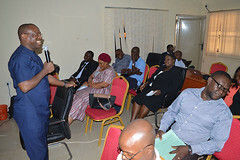 Mr Mekwunye further explained that the meeting would expose the beneficiaries to the programmes of the directorate; help in evaluation of existing businesses; promote feedback and create synergy between the beneficiaries and the State Government. As testified by many beneficiaries, the programme is laudable and has helped in tackling youth unemployment in the state. According to Paul Uzoka, a STEPreneur in Interlocking (Oshimili North LGA), “A month into my training, I started having jobs. I cannot count the number of jobs I have done. I have workers. In fact, we have taken over. I want to use this opportunity to thank Governor Ifeanyi Okowa for believing in the youths. 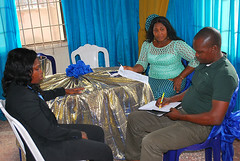 If not for him, probably I would have remained unemployed.” For Cynthia Oma Ehire (Sapele LGA), a STEPreneur in Decoration and Event Management, her starter pack changed her life. Oma said she has not only diversified into catering and makeover, but has trained 9 persons, currently has 15 trainees and has bought a car to facilitate her business.